As I wrote about here, I am currently working on a series of computer certifications. I will add logo's each month or so to show my progress and update you my readers. They are order from most recently earned to the oldest. I have also added at the bottom a list of the names of exams passed to achieve these designation. These exams are a mix of CompTIA exams and Microsoft Exams. Earlier I also wrote about having an inner geek, and working on some certifications, specifically the Microsoft Office Specialist, and about playing with multi OS's. Well that combined with some recent schooling has produced a score of computer certifications. Above are the different logo's representing the specific certifications. The Logo's are in the reverse order that I earned the right to use them. And This post will outline the schedule of certifications I plan to write over the next year and a bit. Here's My setup at work, IBM- Lenovo T61 Docking Station and 2 Viewsonic VA1926W 19InchW monitors. Notice the way cool C64 Commodore Monitor still in use in the left corner. You can see my new den here. These exams were written either at a Prometric Testing Center or at a Certiport Testing Center for the Office exams. The Exams names that have links link to reviews of the books I used to prepare for those exams. Paul and His work as community Builder. In pursuing my studies of Paul, and Pauline theology, I have come to appreciate and understand many themes and issues worthy of discussion and further inquiry. Yet the one that grabbed at my heart and mind to me for further attention was that of 'Paul and community'. It is of particular concern for me, as the struggles around the meaning of 'community' and the process of building and maintaining 'community' within the Body of Christ are of as much import today as in Paul's day. Since many of his letters are addressed to congregations, nay I say communities he founded and helped shape, yet the same struggles and problems are evident in today's Church thus today's church communities. So I believe that Paul's endeavors to create community, and to sustain it after his leaving are worthy of consideration. Why this focus on community? How did Paul create community? From these questions we have a springboard from which to approach the study of Paul and community. However I must state that this list is in no way comprehensive in regards to this topic, but they will lead us on a journey to deeper understanding, and even more questions for further perusal. The question of why such a focus on community is a good place for us to start. From our previous study on Paul, we must ask why would a Jewish Pharisee begin witnessing to Gentiles about a Jewish messiah. The answer is in Paul's experience on the Damascus road and the changes that lead to in his heart, mind and spirit. As can be seen from Paul's Superscripto from 2nd Corinthians 1:1 "Paul, an apostle of Christ Jesus by the will of God,…, to the church of God which is at Corinth." Paul sees himself as an apostle and as being called and sent by God. Again Paul Clearly outlines his self view in Galatians1:11-16 "For I would have you know, brethren, that the gospel which was preached by me is not according to man. For I neither received it from man, now was I taught it, but I received it through a revelation of Jesus Christ. For you have heard of my former manner of life in Judaism, how I used to persecute the church of God beyond measure and tried to destroy it; and I was advancing in Judaism beyond many of my contemporaries among my countrymen, being more extremely zealous for my ancestral traditions. But when God, who had set me apart even from my mother's womb and called me through His grace, was pleased to reveal His Son in me so that I might preach Him among the Gentiles." Here we see a man who used to live in one community, who is now reaching out beyond those boundaries to create a new community that crosses ethnocentric, and religious boundaries. Paul believed he had a call to preach, and his preaching was interwoven with community building. I would go so far as to state that for Paul you could not have Christ followers without having community. Robert Banks also echoes this idea in his book, Paul's idea of Community; he states, "To embrace the gospel, then, is to enter into community. A person cannot have one without the other." Yet this interlinking of the two was deliberate. Banks also states: "In the wake of Paul's travels throughout the Mediterranean, Christian communities sprang up, consolidated and began to multiply. This was the outcome of a deliberate policy on his part. He not only proclaimed the message about Christ and brought people into an intimate relationship with God, but he also explained the consequences of that message for the life of his converts and led them into a personal relationship with one another." Therefore Paul has no choice but to have a focus on community. For that community is interlinked and inseparable from the message of Salvation, which is through Jesus Christ. Now those communities were not perfect and they had problems, much like the Church and churches today still have problems and struggles. This could also then lead us to the question; why is there not clearer instructions on this concept of community in Paul's writings, but that will have to await further studies. 2. Some members had high social status (Providing the house). 3. Made intelligible the attention Paul makes to Families. 4. Training of early Christians. 5. At least one person in the community had to have a house in the town, thus there could be a safe environment for the Christians to meet in. Yet even with this understanding of requirements and advantages of Christian Communities, there are many unanswered issues. Abraham Malherbe in his book, Social Aspects of Early Christians, states: "The current interest in the social aspects of early Christian communities has called for attention to be focused on the communities formed by Christians. Several difficulties, however, confront us in our attempts to describe their constitution from within." However Malherbe's recognition of the difficulties, and my own hesitation should not stop us from wrestling with this vital question. Paul himself has much to say on this topic. First Paul has a desires for there to be unity in the church is clearly seen in from Philippians 2:2 he states, "make my joy complete by being of the same mind, maintaining the same love, united in spirit, intent on one purpose". 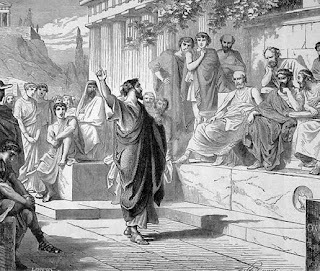 Paul also goes on to state that he is responsible to preach to many people groups for in Romans 1:14 he says: "I am under obligation both to Greeks and to barbarians, both to wise and foolish." And in verse 16 "For I am not ashamed of this Good News about Christ. It is the power of God at work, saving everyone who believes - Jews first and also gentiles." Thus we see his belief that this community can encompass all people groups, Jews, Greeks and barbarians. Paul also clearly states that his teachings are for all churches he has been involved with, that Christian doctrine should be universal in application, in 1st Corinthians 4:17 outlines this: "For this reason I have sent to you Timothy, who is my beloved and faithful child in the Lord, and he will remind you of my ways which are in Christ, just as I teach everywhere in every church." Here we see a concern on Paul's part for those he has taught, that they continue to grow and learn and practice what he has taught them. Paul also has great concern that the communities continue to live the truth, for in Galatians 1:6,7 Paul clearly states there is but one Gospel, and is concerned that the church in Galatia is turning from it. "I marvel that you are turning away so soon from Him who called you in the grace of Christ, to a different gospel, which is not another; but there are some who trouble you and want to pervert the gospel of Christ." So therefore from the above argument, if the gospel and community were interrelated realities, the perversion of the one would also be a perversion of the other. Thus if the Galatians turn from the true gospel, they also turn from true community. Since from this small sampling we see that Paul had great concern for the Christian community, and for the individual churches within that larger community. Witherington states, "Paul clearly believed that "in-house" and "In community" Christianity could make a difference in the first Century world. … Living as a new community, a model of how the new creation changes things, Christians bore good witness to a new worldview." Therefore the community's lifestyle was not just for their own sake but also for the sake of witness. Wayne Meeks makes some very interesting observations; I would like to share two of them here: "And we see both family code and city code crossed by the claims of new loyalties; an empire on the one hand, on the other a new cult that uses at once language of city, family, and empire and challenges all three." And secondly, "They have detached themselves from those ties of place and of family which, in a rural culture, ordinarily determine a person's identity." Therefore we see that this new community challenged all contemporary cultural rules and settings. Thus Paul was not changing the social aspect of society, he was changing the family and community to a new one. It called for one to realign one's loyalties to a new setting, to a Christ Jesus, and through him to his body the church. "For as we have many members in one body, and all members have not the same office: So we, being many, are one body in Christ, and every one members one of another." Here Paul clearly ties together the binding of Christians one to another through there unity. Which will lead us into our next question. How is Christian community expressed? We see that the Christian Community is a body as cited in Romans above, therefore, Christians are parts of a body. The body of Christ, and that this body will have unity. That this community takes place on many levels: the individual house church, the city wide or regional church, and the corporate "C"hurch. Meeks describes it this way: "The church in each city thus typically consisted of a number of small cells meeting in various private houses. Where the Christians were lucky enough to have find a convert or sympathizer who could afford a more spacious house, all the cells in a city might come together on occasion for worship and instruction." Meeks in another work of his The First Urban Christians, states clearly that the individual churches knew they belonged to a larger reality. "The Local groups of Christians not only enjoyed a high level of cohesion and group identity, they were also made aware that they belonged to a larger movement." This is also seen when Paul is making collections for those in Jerusalem who are suffering. The different churches respond to funding the work of God. However Witherington makes too very good points: "Literacy as a criterion for Christian leadership in the early church is a factor too seldom considered." And also, "but I support E. A. Judge's conclusions that early Christianity was led and largely supported by an elite minority who were of the higher social strata." Which when brought together indicates that for Witherington the early church leaders were very probably those who were learned and of some social standing. Thus the earliest Christians created the 'codex' system, for easier production and dissemination of there writings. Which when studied in conjunction with the questions of " what sort" of community, even more broadly spans the social strata. The early communities were also to be a people set apart, a people for God. In 1st Thessalonians 4:7,9,10 Paul's states: "For God has not called us for the purpose of impurity, but in sanctification. … Now as to the love of the brethren, you have no need for any one to write to you, for you yourselves are taught by God to love one another; for indeed you do practice it towards all the brethren who are in all Macedonia. But we urge you, brethren, to excel still more." Here we see Paul thanking a congregation for their concern for other believers, but still challenging them on to more. Thus we see community expressed through love and good deeds. Through care and commitment, we also see it expressed through Paul's continuing concern for the community even when he is not present in person. We see community or at least Christian community as one that attempts to break down the old allegiances, to family, city, state, and have a new commitment to other believers no matter there status, or origins. We see a community that was deliberately fostered and challenged to growth in love and good deeds. Finally then we are lead to our query, how did Paul create community? Of the four questions being tackled in this essay, I believe this is the most difficult. For it requires the most conjecture. However that being stated it is inferred from Paul's words and actions that he did create community, and communities. This was done through a number of methods used either separately or in conjunction. The first is through personal presence and teaching. Paul spent time with these communities in person. He would teach, preach, admonish and challenge them to faith in Jesus Christ then though that to fellowship with one another. After he moved on to another town, he stayed in contact with the previous community(s), through letters, reports from co-workers, through prayer for them and an expectation of prayer and support from them. Paul deliberately found some with means (those with money) in each community who could then host the church and churches activities. But he also went out into the markets, streets and highways to preach and teach to anyone who would listen. He worked hard to cross cultural barriers, and social economic barriers; he would invite anybody into the kingdom, and expect the church to welcome all who came in the name of Christ Jesus. It reminds me of a story I heard a few years back, "This young man a university student became a Christian through outreach on campus. The following Sunday he heads to the nearest church. He comes in and is wearing torn jeans and a t-shirt, and sandals. He arrives a little late and the pews appear to be full. Walking down to the front he does not find a seat open, so he sits on the floor near the front of the church. Now by now people are whispering and coughing. Then an usher comes forward, an elderly man, wearing a 3-piece suit, walking with a cane. It is heard, said 'Bill will straighten him, out, he doesn't belong here, look no suit. …' And other such remarks. The old usher gets up front and rather than rebuking the young man, he slowly and gingerly lowers himself to the floor and sits beside the young man. At this point the pastor gets up, and says 'what I was about to say you would never remember, what we just witnessed you will never forget.'" That is the type of community Paul was working to build, one where love and care came first. Thus I must state that even though I looked at four different questions, through this work I have found that the four are very closely interrelated. What answers one, can then be reapplied to the next, or to the previous. I think it important at this point to reiterate that Paul did have a focus on a new community that was the family of God. That this focus leads to a clear understanding of community and roles and responsibilities within that community. Paul deliberately was an architect of building community and community that crossed all barriers, Jews, Greeks, and barbarians, poor and rich, slave and freeman, male and female. That was universal and strived to live the best of both Judaism and Roman culture. For Paul community was integral to being a Christ follower, just as it should be for us today. Source unknown a story I heard. Who is Paul? Can we really know? This is my approach to Paul and Pauline Studies. Who is Paul? Can we really know? This is my approach to Paul and Pauline Studies. Who is Paul? Why is there so much debate about Him? Why is there such controversy around him and his writings? Does it matter to me as a scholar? Should it matter to me as a believer? These are some of the questions that I approach this paper with. My purpose is to examine my approach to Paul and Pauline studies, to clarify my research and work to date, and where it can lead in the future. I will approach this topic through three avenues, the importance of Paul: 1) to history, 2) to Christian history and church thought and 3) the Paul of my understanding. Yet the more I read and study the less I feel equipped to do this vast topic justice. So my first task will be to map my journey to this point of writing a paper on Paul. Then I will endeavour to engage the sources for Pauline information, and the appropriateness of them to this work. Then I will look at some titles, or better some categories, that I have discovered, that are overlaid upon Paul, and his life, his ministry and his writings. I will also include two appendices that are really my starting points for this work. The first dealing with a chronology or Paul's life, and the second a chronology of his writings. The second area where I have discovered self-weakness is in presuppositions. I have come to realize more and more, as I progress academically that I look at everything through a plethora of lenses. Each of these lenses colours what I read, hear, study and affect how I interpret each of the previous three. I have the lens of having been raised Roman Catholic, on my fathers side, and Being an Irish Roman Catholic that was always taught to fight and struggle and question all. The second perspective if that of a Gaelic warrior poet, often seeing and embracing the extremes, and believing moderation was for monks. The third most predominant lens is that as bible believing born again Christian. This third lens, allows me to study this material academically, but it always brings up more and more questions as opposed to answers. These lenses affect my sight in many and varied ways. I was reared to believe that Paul was one of the greatest of Catholic 'Saints', which though he had sinned much, repented and atoned much. That he lived the rest of his life from conversion, that his suffering and persecutions were a form of atonement. Yet through my own readings of his letters that is not how he presents his trials and sufferings. So even though I will endeavour to overcome these lenses and do Paul and his thought world justice, or as much justice as I can. I feel as if I am standing under a great arch, a mass of Pauline scholarship and theology, though I admit to some shortcoming in my abilities. I will be do justice to Paul to the extent I can. Just as no scholar has yet come up with a complete composite of Paul, neither will I. Nevertheless this enterprise will still be worthwhile. However I will engage Paul and the theologians, and come out enriched, stretched and with more questions to lead me further on this quest. I will endeavour to be careful to avoid the trap of isogesis, while approaching Paul and Pauline texts and the secondary sources of other theologians and academics. I will also attempt to avoid being anachronisms in applying modern tools, psychology, thoughts or approaches to Paul the man. I have come to the conclusion that there are two sources for the study of Paul, and in each source there are three sub-categories. The two categories are Cannon and then the secondary source of Theological sources. In the category of Canon there is: the seven Authentic or for the most part undisputed letters; which are 1 Corinthians, Philippians, I Thessalonians, Galatians, 2nd Corinthians, Philemon, and Romans. As well as six pseudo-epigraphic Pauline letters, then secondary cannons, both the book of Acts and those writings that did not make canon such as "The Acts of Paul". Then for the area of theological works, I subdivide into three classes as well, Christian Theologians, Jewish Scholars, and other religious academic works(Not that the first two are not academic, but the third category has no specific religious affiliation). The Paul of scriptures, and other early non-canonical writings is one of conflict and one of varied uncertainty and debate. The easiest to identify is the differing accounts of the Apostolic Council written about by both Paul, and by Luke, by Paul in Galatians 2:1-10 compared with Acts 15. The key question in these passages is, weather Torah had soterological relevance to the Gentles. Paul clearly paints a different picture of this event or at least the decisions made then the account appearing in Acts. So from this very early period there was some debate and problems between Jewish believers and between Gentile converts. Thus we see a Paul, both in his writings and in Acts as one who does not back down from debate within or without of the body of believers. Thus often Paul ends up having to defend his credentials, and his purpose and actions. Galatians 1 is a great example of this, Alan Segal states in relation to this passage and I agree; "Paul is displaying his credentials because the other apostles do not recognize a person as an apostle who did not know Jesus." There for as Paul himself states, he had conflict with other believers, with Jews, and with Greeks. As can be seen in 2 Corinthians 11:22-28 especially verse 26. Then when we move on to the secondary source theological texts, it could almost be said there are as many different views of Paul as there are Pauline Scholars. Daniel Boyarin wants to reclaim Paul as an important Jewish thinker and cultural critic. David Wenham questions weather Paul was a Christ follower or the real founder of Christianity? Both J. Christiaan Beker and N. T Write present Paul's Christianity of the completion of the Covenant, or fulfillment of the Old Testament. Thus I see Paul's ministry and teaching as that of a Spiritual Father deliberately building a Family of God that is universal in its invitation. A man passionate for God and committed to following His vision of Christ no matter the personal cost. At this point I will look at some of these categories in specific detail, starting with a Jewish scholar. Jewish scholar Daniel Boyarin in the introduction to his book A Radical Jew: Paul and the Politics of Identity states: "This book is the record of an encounter with some of the most remarkable texts in the canon of western literature, the letters of Paul. If one measure of the greatness of a work of literature is its ability to support many interpretations, then certainly these texts must rank among the very greatest of literature, for they have spawned and continue to spawn - anew every morning - not only new interpretations of particular passages but entirely new constructions of their complete thought world." (p.1) While I agree with some of Boyarin's statements, I disagree with others. I agree with the importance of these works, it's continuous effect throughout western history, and western thought. Whereas Boyarin looks at these writings primarily as cultural criticism of Judaism in the Roman period, I approach them as Divine scriptures. As such there material is not just important from a philosophical perspective, but also from a religious or practical use. Boyarin goes on to state: "This means that Judaism formed itself for good and for ill in the context of Pauline (and other Christian) thought, sometimes undoubtedly reacting simply for the purpose of self-definition but also more, more positively, answering in its own distinctive fashion theological and other challenges placed before it by Pauline Christianity. (p.2)" I would go so far as to state that the converse is also true, that Christianity, especially Pauline Christianity formed itself, in many regards initially in reaction to its mother religion of Judaism, and specifically in regards to what Paul calls "Judiazers", Specifically in Galatians 5 and 6. I also strongly disagree and agree with Alan F. Segal, who states in his book Paul the Convert, "Although we have considerable writings from Paul, his biography is incompletely known. … Paul's letters, though widely read, thus turn out to be among the most difficult and complicated writings in western literature. (p.xiii)" I agree with his analysis that Paul's biography is very incomplete with many holes in it. But I do not believe that his letters are difficult. From my perspective they are often straightforward and written to be understood at face value. The problem comes in trying to make them say something they do not say the error of Isogesis, or trying to not have them say what they say or imply. Through my readings and studies, I have come to see that many people apply categories or titles, roles and positions onto Paul, and his work. I have observed book after book, written upon a specific aspect of one or another of these classes. These groups include such things as Prophet, Priest, Pharisee, founder of a religion, Apostate to his faith and people, teacher, preacher or radical counter cultural revolutionary. There is also debate on almost ever view of Paul, from feminist liberator to Patriarchal repressor of women. Then within these roles, there are different interpretations of events or actions on his part. The most debated is the Damascus Road experience thus the issue of convert and or call. In that we also have the questions about what happened at this critical juncture in Paul's life, was it a revelation of God, if so what of and what is the significance of it? If not what prompted the radical changed in Paul. From Paul's own writings we have many of his views on some of these categories. In Galatians 1:1 we have the synopsis of Paul's self-thought, he sees himself as an apostle, sent of God, the God who raised Christ from the dead. Furthermore he states in Galatians 1:11,12,16 That he has received a direct revelation from God, that his teachings do not come down from men, and that he has been called to preach to the gentiles. In this chapter in v15, 16 he specifically speaks about a Call from God, and a mission to the Gentiles. Then again in 2 Corinthians 5:16-21 he speaks about a new life in Christ, having a ministry of reconciliation, and of Paul himself being an Ambassador for God and Christ Jesus. Yet for all the clarity in Paul's descriptions of himself and his role, the theologians have had a continuous debate from the time of Paul to present, and it does not appear it will cease to be an issue any time soon. I agree with Gunther Bornkamm's approach to viewing Paul: "Paul himself has little to say about his conversion and call, and when he does mention them it is with reserve. But we can now see that this is not something to deplore. The power of the concern for the Gospel which lighted upon Paul and became his own is also revealed in the way he speaks of his conversion. This again confirms that for him the one thing of importance was the gospel he was given and not his own person. (P.25)" But I must disagree with the first part. Bornkamm does not make a distinction between conversion and call, The Conversion is the road to Damascus, and the road from Damascus is the call to ministry, the gentiles. I do not observe this hesitance to speak of his call, as can be seen from the numerous references to it in the previous paragraph, from Paul's own writings. I also believe that Richard N Longnecker makes a very valid point in stating "that what he (Paul) says in his letters about his conversion is set within the respective purpose of each of those letters" (P.19)6 Thus we must read Paul within the context of his writings and not just pull out the meanings we want to see. As Alan Bloom states in The Closing of the American Mind, "Lack of education simply results in students' seeking for enlightenment wherever it is readily available, without being able to distinguish between the sublime and trash, insight and propaganda" (P.64) I feel like this is a description of Pauline theological works. From my samplings of Pauline literature, thought and opinion. I have yet to be convinced of many issues that are hotly debated. However I do feel that I have grown, and been stretched by the process. I have been challenged to pursue the bibliographies from each book I have read for this course, each was like a step deeper into the pool of Pauline Theology, each asked the question of 'where to go next?' thus leading me to pursue a thought or theme further, until I have wrestled with these issues and like Jacob's night with an angel, come up blessed after the long hard night of work. I do have some beliefs and convictions about Paul, his writings, and his thought. But those beliefs have not become dogma's, they are not so locked as to override all other beliefs and convictions. I am open to being convinced of my error, and of my mistakes. So I will continue to pursue Paul, to seek for the truest essence of His thought and writings. In conclusion this paper has demonstrated in part that Paul is not just a Jewish critique, as Boyarin would have us believe. Thus my Paul is the Jew, who was a follower of Christ, who experienced a call, this call led him to become a witness beyond Judaism to the gentiles. As such I would disagree strongly with Bornkamm's statement that Paul is reluctant to talk about his call. A man fully committed to following God. He was a Pharisee, who till the end claimed allegiance to that sect of Judaism, but lived and taught it very differently then most Pharisee's would have accepted. As such he was a founder of churches, and a deliberate builder of a new paradigm of community. In conclusion I fell as if I have entered a vast library filled only with Pauline thought and opinions, and have wandered around randomly selecting texts to engage with. Now I must refocus and become more selective, and discerning. I have but sampled this great area of research and am left with a hunger for more. As I began I wondered where this exercise is leading, and I have as of yet no definite answers. I do know that Pauline literature will always be an interest and passion of mine. I could see myself pursuing a thesis on a particular topic in this vast field. Paul was a man who lived in troubled times, but who lived out his faith. I will endeavour to do the same. The working out of a Pauline Chronology presents some difficulty, but I do not believe that it is impossible. In working on this chronology we must realize that there are both dates of Absolute and also dates of relative Chronology from which we are working. So we must work with Absolute dates, such as times or rules or Emperors, or Governorship with those we know link. Still to some extent there is guess work or conjecture, but there are a few solid pins around which we can build this timeline. The best such pin is Gallio, in Acts 18:12 we have an uprising while Gallio was proconsul, tying this to "the Gallio inscription at Delphi" we can thus place Paul in Corinth in the Spring of 51AD. Combining those Dates with Paul's most extensive chronology in Galatians 1 As well as events in Acts. From this info and Acts 24:27 we can place Paul in Caesarea at the time of the Changeover between Felix and Festus which had to take place sometime in 59 or 60AD. Also with a little liberty if we assume the Saul in Acts 7:58 to be Paul, then we can presume he was a young man at this time, would have been young at the time of Christ's death. Therefore I come up with the following Chronology for Paul or Saul or Tarsus. Thus giving us 17 Years or 16 years +/- 1 year. If we set Jesus death at AD 30. First I would like to argue for the possibility and I would say probability of the authenticity of all Pauline Canon in the New Testament. There are two quotes from Ben Witherington III, supporting an authentic possibility of the disputed Pauline letters I would like to share, from his book The Paul Quest: "I for one am not yet convinced by the arguments for inauthenticity, and it is notable that many New Testament scholars who had spent years on these letters were not convinced either (cf. the commentaries by J.N.D. Kelly, C. Spicq, Joachim Jeremais, George Knight, and on 2nd Timothy especially, Luke Thomas Johnson. (P.112)" …"It is quite unbelievable that Paul the letter writer, if indeed released from house arrest in Rome in 62, would never again write to his converts and never again be concerned about the churches he had already founded, even if he still planned to head west to Spain. It is even more unbelievable that he would have left Timothy and Titus in the lurch if he had had an opportunity to encourage them shortly before he died. (P.113)" However because of the considerable debate on this fact the Pastorals will be left as an aside to this study for the most part. I think the most interesting of the correspondences from a historical perspective is the rebuilding of the Corinthian Correspondences. My belief is that there were at least 5 letters from Paul to this church. Letter A has been lost to us. Letter B is what we now call 1st Corinthians, for in chapter 5 versus 9,11 Paul mentions a previous letter. Then 2nd Corinthians appears to be made up from at least 3 different fragments of letters. Letters C is the Apology, Letter D the letter of tears, and finally letter E ref, to letter of tears and plans to visit them again. The most unique of the Letters is Romans, first it is a letter written to a congregation he has yet had any direct contact with. Second it is not in response to specific problems in the congregation, and is the closet thing we have to a systematic theology by Paul. All of his other letters appear to have been written 'on the fly' and in response to specific issues. Peter Frick said in a lecture for RS 209 June 8th 1998 "With just the book of Romans, and no other books of the bible Christianity would have probably developed the same." The Closing of the American Mind. A Radical Jew: Paul and The Politics of Identity. Famous Children's author Madeliene L'Engle once stated that writing children's literature was harder than writing for adults because children ask more questions; children just do not accept what an author writes the way most adults will. Her statements have always stuck with me and since doing a children's literature course a few years back, I have continued to read children's and teen fiction regularly. Usually I look for books that have a lot of buzz about them, have then been nominated for a Newbury, or Mr. Christie, American Library Association or here in Canada a Governor General's Literary Award (more commonly know as the GG's.). If so I try to pick it up and give it a read. Because of that I tend to browse the children's and teen sections at Chapters when I happen to be in a store. The cover of this book captured my attention and almost compelled me to purchase it. The representation of our Heroine Alexa is a very striking image. I purchased this book when it came out nearly 2 years ago and yet only just recently picked it up to read. I now regret that I did not read it sooner. In part, I hesitated reading the book because the cover art was so powerful and cast such a spell upon me, I feared the text not living up to the story I had begin to build in my imagination. Those fears were unfounded. The Story is set in a walled kingdom. A Kingdom built like 3 spokes on a wheel. Alexa is from Lathbury, the south western spoke, from the hub of Bridewell. This walled Kingdom was built by the Warvold after his extensive travels in the wild mysterious world. He built walls around the central town of Bridewell, and walled roads out to the three surrounding towns of Lunenburg, Turlock and Lathbury. Yet upon the eve of his death, he hints to Alexa that the walls, once thought to be the salvation of the towns and their civilization, he now considers to be a mistake. Alexa begins an adventure shortly after the Warvold's death that will affect her and this kingdom for time to come. Yet the Warvold's death has caused a society once stable and thriving to start to spin out of control. Alexa sneaks outside the wall and meets a dwarf and a talking wolf and is summoned to a council, the severity and importance of which not even the participants can realize. Can Alexa fufill a calling upon her life that the Warvold foresaw and that some others are trying to help happen and others wish to thwart? This is one of those great books, originally written for children, that can captivate an audience of any age. Carman has an extremely mature voice and he writes in a manner of a master wordsmith. Carman only conceived of this series in his mid thirties; it is an extremely well- rounded and crafted world - a pleasure to visit, and I plan to re-enter the land of Elyon again and again. I have had the pleasure and privilege of taking a number of courses from Dr. Peter Frick, at St. Paul's United Church College at the University of Waterloo. I have seen this book go through many transformations and different drafts and editions, as it was used in class with hundreds of students. I first encountered the book in 2001 in the course it was written to support. Since that time I have gone back and worked on my New Testament Greek on a number of different occasions. I have even worked for Dr. Frick as a research assistant, and helped develop the web-based version of this course. I have used about 15 different New Testament Greek textbooks over the last decade or so. Having a dual form of dyslexia, learning languages has always presented difficulties for me. When working on NT Greek I have used all the tools I could find - books, audio books, and Study Aids and Study Guides galore. The book I always come back to is Dr. Frick's. Dr. Frick's approach seems to me to be the most logical and practical, such that by the end of the book you will have the 500 most occurring words in the Greek New Testament in your vocabulary. The next largest advantage is that by the time you are halfway through the book, you will have enough vocabulary to read entire passages in the Greek New Testament. Dr. Frick accomplishes this by introducing the reader to both verb and noun forms of the roots of words. What this means is that you will encounter words for which you know the root as either a verb or noun form, and recognize it, and can put 2 and 2 together and recognize prefix or suffix that is the other form as noun or verb with the root and determine the meaning of the word. This is one of the most encouraging results of Dr. Frick's method. As you progress through the chapters and the lessons in the book, you are able to read more and more of the New Testament and writings contemporary to it. Another great strength of the book is its appendixes that have extensive samples of writings from the time of the New Testament, and Study Guides and Aids. The book also provides answer keys to working through each chapter. This book will be of great benefit to a casual self-taught scholar wishing to read the New Testament in the original Greek, or to the serious academic scholar beginning his or her adventures in New Testament Greek Studies. I even know a classics major who took this course rather than the Classical Greek because of the speed at which he would expand his vocabulary in this course versus the Classical Greek course. Now after many years of revision in class, testing the material term after term it is finally published for the general public. This book will always be a treasured resource on my bookshelf. If you pick it up I am sure you will find it invaluable to your biblical studies as well. The material in this book is full of screen shots, hit and tip boxes, colour-coded charts and more. Each chapter begins with the objective matrix for the chapter, then outlines the new terms or key terms introduced in the chapters. After that comes the substance of the chapter, then a Summary Skills Matrix which reviews what you should have learned and what you should be able to do having completed the specific chapter. Then there is a knowledge assessment section with fill-in-the-blank, T/F and then some in-depth answer questions. Finally, there are some case scenarios to apply your knowledge, all of which should help you either when learning in a classroom environment or in self- study. Fowler writes in an easily-accessible manner. His balance of technical and lay terminology will help the new learner, but provide enough insight for the more advanced student to not be bored. 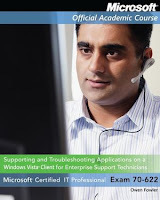 This book is a good resource for anyone wishing to expand his knowledge of Vista in an enterprise situation or preparing to write a certification exam. This book is designed to be a training tool for the new Microsoft Certified IT Professional certification. Specifically written as a Microsoft Official Academic Course, it is designed to give you all the tools to pass the certification exam 70-622. This book is very accessible. It is a pity that Fowler has given up his career in technical writing for his books are good tools for students learning the trade.